If you type "google calculator" in the search field a online calculator appears. But there is also another hidden calculator in the search bar it provides and direct response when asked a conversion or a mathematical operation. In the first line of displayed results, you find the solution! And the calculator is displayed too. How many months in 4 years? 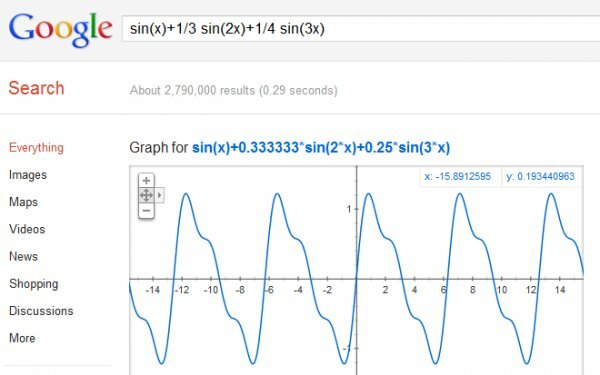 But we will turn instead to Wolfram Alpha to display graphs of formulas as its possibilities are much broader and 3D figures obtained also more elaborate. Other functions are hidden in the search bar, including translate and about. The keyword translate can make translations between human languages. Another example, during the Olympics could have the number of medals for a country by typing "country name Olympic." Google Earth. Earth also includes two hidden tools: a simple driving simulator and a flight simulator. about: plugins (list of installed plugins). In Chrome, the word about may be followed by all that we want to test it in the browser: Other examples: about: memory (compared use of memory by Chrome and other browsers), about: cache ( list pages in memory).